MEXICO CITY, Mexico (CNN) -- Mexico City's thousands of stores went green Wednesday, as amended ordinances on solid waste now outlaw businesses from giving out thin plastic bags that are not biodegradable. 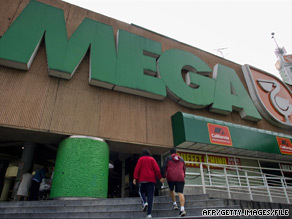 Mexico City stores, such as this supermarket, can no longer give out non-biodegradable plastic bags. The law affects all stores, production facilities and service providers within the Federal District, which encompasses the city limits. Nearly 9 million people live inside the district and another 10 million reside in surrounding communities that make up greater Mexico City. Mexico City becomes the second large metropolitan area in the Western Hemisphere to outlaw the bags. San Francisco in March 2007 enacted an ordinance that gave supermarkets six months and large chain pharmacies about a year to phase out the bags. Los Angeles is set to impose a ban if the state of California does not enact a statewide 25-cent fee per bag by July. About 90 percent of the bags used in the United States are not recycled. Bans and other restrictions on plastic bags are in place in several countries. China has adopted a strict limit, reducing litter and eliminating the use of 40 billion bags, the World Watch Institute said, citing government estimates. Although compliance has been spotty, violation of the law carries a possible fine of 10,000 yuan ($1,463), World Watch said. In Tanzania, selling the bags carries a maximum six-month jail sentence and a fine of 1.5 million shilling ($1,137). Mumbai, India, outlawed the bags in 2000 and cities in Australia, Italy, South Africa and Taiwan have imposed bans or surcharges. Ireland reported cutting use of the bags by 90 percent after imposing a fee on each one. Blog: Is Hong Kong eco-trendy or eco-serious? Some leading environmentalists are calling for a global ban on the bags. Achim Steiner, executive director of the United Nations Environment Program, says plastic bags are the second-most-common form of litter, behind cigarette butts. The bags are the greatest form of litter on the globe's oceans, the U.N. agency said in a recent report. The bags are also a major threat to ocean wildlife, causing the deaths of 100,000 sea turtles and other marine animals that mistake them for food. "Thin-film, single-use plastic bags, which choke marine life, should be banned or phased out rapidly everywhere," Steiner said in June. "There is simply zero justification for manufacturing them anymore, anywhere." Mexico City, which has had some of the worst air pollution in the world, also is looking at improving its environment in other ways. The municipal government announced this month it will place more than 1,100 bicycles at 84 stations throughout the city for residents to use. Officials said they hope to increase bicycle use as a form of transportation to 5 percent, up from the current 1.2 percent.